La Orden de José Martí* – The Order of José Martí recognizes outstanding service in the fields of Hispanic scholarship, the teaching of Spanish, and the promotion of good relations between English-speaking countries and those of Spanish speech. La Orden de Don Quijote – The highest honor conferred by Sigma Delta Pi, the Order of Don Quijote recognizes exceptional and meritorious service in the fields of Hispanic scholarship, the teaching of Spanish, and the promotion of good relations between English-speaking countries and those of Spanish speech. Premio Germán D Carrillo – The German D. Carrillo Award is a triennial recognition for a Sigma Delta Pi member who has made outstanding service contributions to the National Collegiate Hispanic Honor Society. Premio Jorge Luis Borges – The Jorge Luis Borges Award, one of Sigma Delta Pi’s most selective honors, recognizes the lifetime achievement of those committed to the activities of the National Collegiate Hispanic Honor Society. *Formerly La Orden de los Descubridores. Capítulos de Honor y Mérito / Honor Chapters – 10-15 chapters are recognized annually for their outstanding activities. Chapter Project Grants – Eligible chapters of active status–at least one induction of new members in the prior three years to include the current–may apply for a grant to support a chapter project that complements the mission of Sigma Delta Pi during the upcoming academic year. Sigma Delta Pi-SHH Chapter Grants – Eligible Sigma Delta Pi chapters of active status–at least one induction of new members in the prior three years to include the current–along with an active chapter of the Sociedad Honoraria Hispánica (SHH) may apply for a joint grant of up to $300 to support a collaborative project in spring 2018 that complements the missions of Sigma Delta Pi and the SHH. Premio Frida Kahlo – Established in 2006, this award is presented yearly to a chapter for its outstanding website. 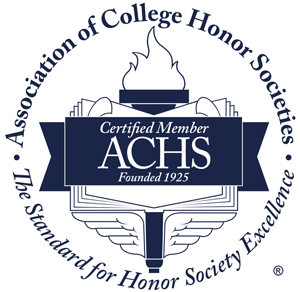 To be considered for this honor, chapters must e-mail their current website addresses to the Executive Director by December 1 of the year in question. Websites are judged on the basis of information provided, navigability, appearance, innovation and current maintenance. The selected chapter will receive a handsome plaque. Premio Ignacio y Sophie Galbis – Established in 1997 to honor two individuals who dedicated their lives to Sigma Delta Pi. Ignacio, with the help of his wife Sophie, served more than 20 years as Executive Secretary-Treasurer (1977-1997). The Ignacio and Sophie Galbis Award is granted yearly to a chapter for its exemplary activities representing the highest ideals of the Society. Premio Octavio Paz – Founded in 2004 for those chapters that maintain Honor Chapter status for a complete triennium. Premio Fénix – Established in 2012, the Phoenix Award recognizes one chapter for a year of extraordinary and exemplary activity as compared to the previous year(s). Graduate Research Grants – Eligible graduate students who are active members of Sigma Delta Pi may apply for grants to support travel ABROAD to Spain or Spanish America for the sole purpose of research related to Hispanic Studies. Undergraduate Study Abroad Awards – Eligible undergraduate students may apply for a variety of study abroad scholarships or stipends for use during the summer and the academic year. Premio Gabriela Mistral – Granted to an outstanding graduate or undergraduate student of Spanish who is an active member of Sigma Delta Pi and who has demonstrated noteworthy involvement and initiative in his/her chapter. Honorary members are not eligible. Any active chapter may nominate one student per year for the Gabriela Mistral Award and shall send the nomination together with supporting documentation, including at least two letters of recommendation and a current transcript, to the Executive Director. Winners of the award will be given a beautiful certificate compliments of Sigma Delta Pi and the book De Chile al Mundo compliments of the Gabriela Mistral Foundation. Premio Mario Vargas Llosa – Granted yearly to one undergraduate Spanish major or minor who is a member of Sigma Delta Pi and who has demonstrated outstanding achievement in all upper-division courses completed and exemplary involvement in extra-curricular activities as related to Spanish. This is a joint award of Sigma Delta Pi and the American Association of Teachers of Spanish and Portuguese. Premio Ana María Matute – Granted each triennium to one graduate student of Spanish/Hispanic Studies who is a member of Sigma Delta Pi and who has demonstrated outstanding achievement in coursework completed and exemplary involvement in extra-curricular activities as related to Spanish/Hispanic Studies. This inaugural award was granted in summer 2016 and is a joint recognition of Sigma Delta Pi and the Asociación Internacional de Hispanistas. Distinguished Service – Select Chapter Advisers are recognized for their exemplary commitment and years of service to Sigma Delta Pi. Premio Minaya Álvar-Fáñez – Established in 2004, this award may recognize yearly one Chapter Adviser for exemplary initiative in encouraging and assisting with chapter activities. The awardee will receive a plaque, a cash award and will be chosen on the basis of the annual reports that each active chapter submits at the end of the academic year. Premio José Martel – Once every three years, at the national triennial convention, Sigma Delta Pi honors our most outstanding chapter adviser with a cash award and a beautiful plaque. A call for nominations for this distinction is announced the fall prior to the national triennial convention.